What type of contact lenses are used to restore your vision? Our keratoconus treatment protocol focuses primarily on designing and prescribing highly customized contact lenses made specifically for treating keratoconus. Using this treatment, the majority of our keratoconus patients have experienced restored vision without the need for surgical procedures, such as corneal transplants or corneal implants (Intacs). We have also helped many patients who still have vision problems after undergoing these surgeries (at the recommendation of other doctors). 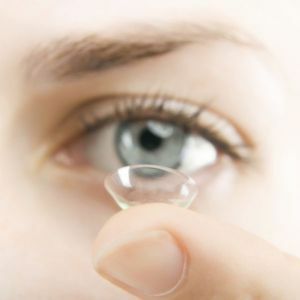 Scleral contact lenses are large-diameter lenses that provide clear and comfortable vision for keratoconus patients because the lenses do not actually touch the cornea. Instead, scleral lenses vault over the entire corneal surface, resting on the “white” portion of the eye known as the “sclera.” The space between the back and front portions of the scleral lens is filled with unpreserved sterile saline solution, which means that the eye always remains in a liquid environment. These lenses are made of a firm durable plastic that transmits oxygen. The rigid material allows the lens to vault over the cornea, which replaces the cornea’s irregular shape with a smoother and more uniform surface that improves vision. Custom soft contact lenses are designed based on precise measurements of a patient’s eye. These lenses are often more comfortable to wear than RGP lenses. “Piggybacking” involves placing a soft contact lens over the eye and then fitting a gas permeable lens over the soft lens. This can increase comfort because the soft lens acts as a cushion pad under the more rigid gas permeable lens.